Welcome to International Working Out Loud week which will run from 7-13 November 2016. The Theme of this Wolweek is “Working and Sharing Purposefully”. Each day this week this blog will share a discussion of the 7 Days of Working Out Loud post. Throughout the week and in the coming weeks we will also be sharing blogposts, interviews, and other content to help practitioners of working out loud to lean and to spread the movement. We made it to the end of the working Wolweek. The weekend is a time to relax (a little), build relationships (a lot) and reflect. When I reflect back on the week what stands out is the help. 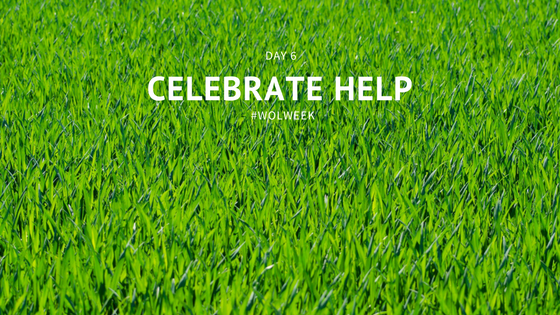 Wolweek is only possible through the efforts of volunteers. Around the world people went out of their way in a busy work week to take a step to share working out loud and this movement. Podcasts, fireside chats, panels, events, talks, tweetchats, interviews, blogs, posters, posts, infographics and more all materialised with little coordination because of the passionate efforts of others. To all those many people, I say thanks and celebrate the contributions they made to their work and their communities. Nice words, but I’d guess right now you that the warm glow of a shared celebration didn’t last long. Why? That celebration above, as genuine as it is, is generic and non-specific. It has a ‘you know who you are’ feel. Nobody is named out loud. Nobody’s actions were identified and no particular outcomes towards achieving our common purpose were highlighted. Like shouting ‘good job’ to a team, the celebration fades when the last echo dies. We can do better to celebrate the help we receive and working out loud is our guide. The best celebrations are purposeful. They are shared in a community. They are in the flow of work, timely and rich in the context of what was done and how it advances purpose. Most important of all they are deeply personal contributions to richer relationships and a growing sense of community. Reflect on your work. Whose contribution to your work deserves a shared celebration? Take 5 minutes to thank them properly, deeply and out loud. That’s a celebration that doesn’t fade, but instead grows.